Wonder Puff loves nothing better than to visit our friendly neighborhood goats. We live in the city where farms are not easy to come by – so this is always kind of a big deal for T. We save up the heels of bread and stale bagels in the freezer for weeks to get enough to feed to our hungry little friends. These poor little guys live just beside a busy road, and Puff cranes her neck to catch a glimpse of them every time we drive by. 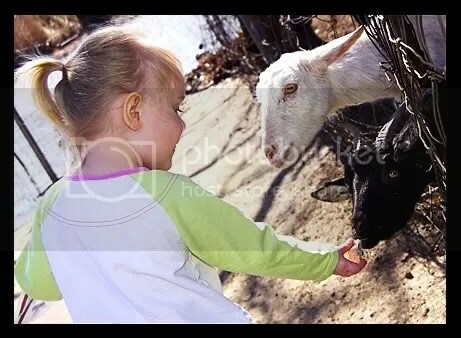 T is always very careful to make sure that every goat gets their fair share, though they push and shove to get close. T lets them know: “YOU HAFTA TAKE TURNS!” YOU HAFTA SHARE! STOP BEIN’ NAUGHTY!” But those goats don’t listen very well. . . I like the little baby goats best, but T likes the big old man goats with their big horns – especially when we get to see them beating their heads together to show which one is the boss! 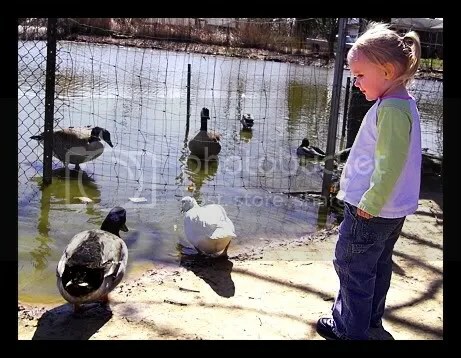 And don’t worry, T never leaves the ducks or the geese out! 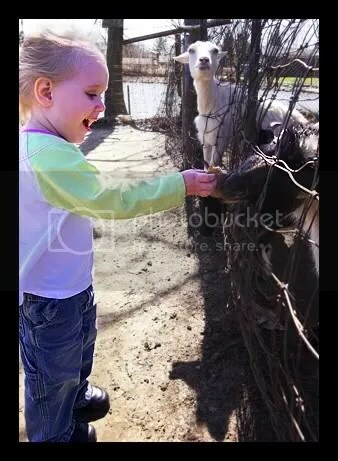 She’s always super happy to feed them lunch, too. . . It never takes us very long to exhaust our supply of yummy bread things, but T thoroughly enjoys every moment of it. We’ll be heading back out again soon, as our discarded bread pile is starting to take up too much room in the freezer! Hey, are these the goats on Perry whatever Road (where I used to live)? She would be in heaven to come here (this summer). Even though we drive past the horses and cows every single day, Tori (and I) are still excited by them just as much. We don’t really get to feed them, but they are still fun to see. Yup! Those are the ones! She’d love to come up there, I know you do all kinds of fun things, but poor T hasn’t ever even seen a horse up close *cries* We’re workin’ on it! Later in the summer, yes – after your babe arrives! You have a bread pile too? Glad you had fun with the animals. Isn’t nature exciting? That is so sweet of the Puff to feed the goaties. Love the pics. My little guy loooves that book, by the way. 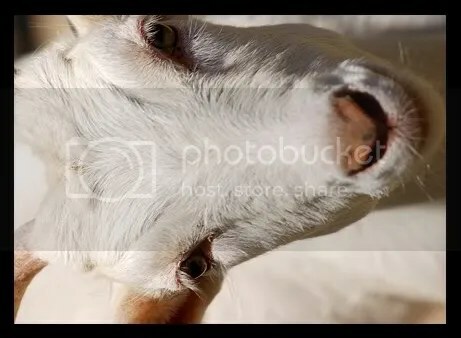 Woah you guys are seeing goats without me? I didn’t know you were a huge goat fan. 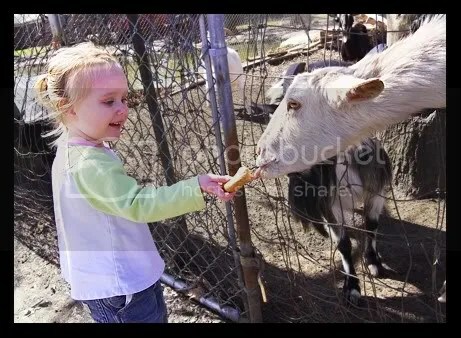 . . T and I and going goat feeding again tomorrow with baby A and her mom, if you want to come with the girls! 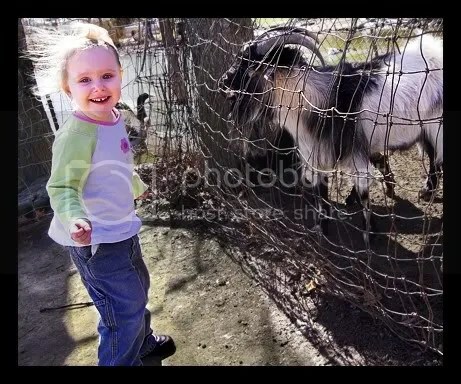 You remember back when we would go over Paul and Kara’s grandmom VanAdder’s house right next door to these goats? That was YEARS ago! Her expression is priceless–she looks thrilled! !